HR Core’s Employee Self-Service (ESS) and Manager Self-Service functionality allows staff to find information from anywhere, on any device, at anytime. 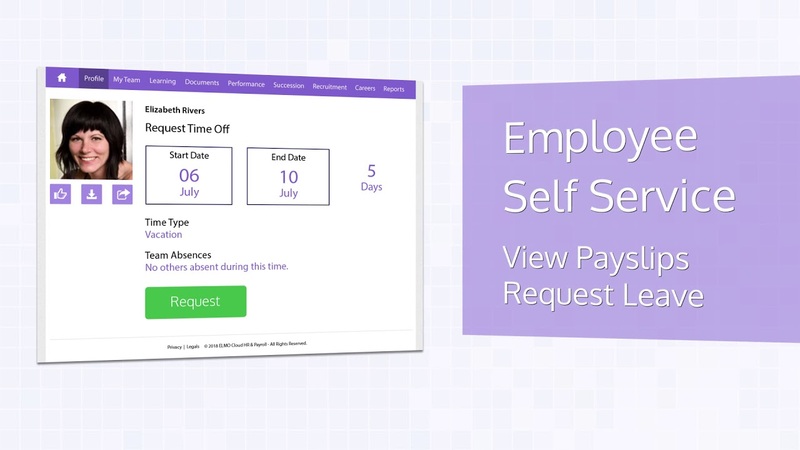 It enables employees to apply for leave and check their leave balances, and for managers to oversee absences. HR Core integrates with the other modules in ELMO’s cloud HR & payroll suite, as well as other compatible systems through an API – providing peace of mind for organisations operating multiple systems. HR Core’s self-service functionality allows employees to access and update personal information making leave management easier. Likewise, managers can approve leave requests, forecast leave entitlements, and produce reports & analytics. HR Core provides integration with other payroll systems or systems that can transfer data inbound & outbound providing users with the peace of mind of being able to use multiple systems that seamlessly interact with each other. Find out more details about ELMO HR Core.